McGary, a preseason All-American, has been limited to eight games this season after breaking out with a series of high-profile performances during last season's NCAA tournament run. 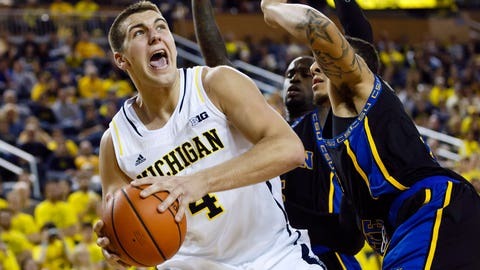 Michigan center Mitch McGary could miss the rest of the season after back surgery. McGary, a preseason All-American, has been limited to eight games this season after breaking out with a series of high-profile performances during last season’s NCAA tournament run. He sat out all of Michigan’s preseason training with the lower-back injury, and after returning for some non-conference games, he missed Michigan’s one-point win over Stanford on Dec. 21. The team did not give an expected date for his return, but with Big Ten play about to start, it would seem unlikely that he will return until the fall. "My back problems have been a daily challenge ever since late August," McGary said in a statement. "We have worked hard rehabbing the injury and I thought that everything was proceeding in the right direction until the last two weeks. I have consulted with my family, my coaches and our doctors and decided the best option now is to have surgery. "This was a difficult decision to make because I want to be out there with my teammates. At the same time, I need to be healthy to give everything I can on the court and help my team." Michigan coach John Beilein said that McGary had done everything possible to return without surgery. "He has worked very hard over the last few months and during his earlier rehab," he said. "He was making progress in practice and games; however, lately he began to experience the same pain he had when we held him out of preseason practice this fall."